In a new series, Audio Video Pro answers readers’ questions about the right equipment for their assignment or their production. I record occasional videos of lectures, and use video to review my speeches and training courses. Currently I use a Sony NEX-5 compact system camera: it usually does what I need, most of the time). But one challenge with this camera is the lack of any mic input, so I’m looking for an audio recorder where I can hook up a couple of mics and record, for later syncing in Final Cut. I’m considering the Tascam DR-60 recorder. 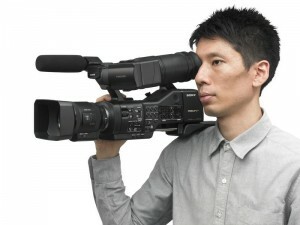 I am also curious about the NEX-VG900E camcorder, as it can use the lenses I already have. Would that be a better option than the NEX-5 for recording the sessions? As well as the e-series lenses I also have some Alpha lenses. 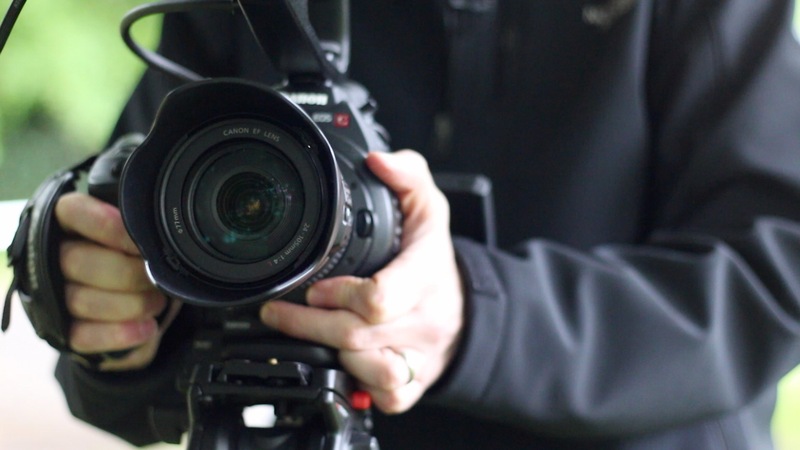 Choosing the right camcorder or audio equipment means weighing up the needs of your production, your time and your budget — and the vast range of equipment out there today. But, given your requirements, and the kit you already own, it’s possible to narrow the options down to what is, hopefully, a workable shortlist. Firstly, let’s look at audio. As you say, the NEX-5 has no on-camera microphone input, and Sony doesn’t make an external mic adapter for the NEX compact system camera line. But it does make an external mic. Sony’s ECM-SST1 connects to the NEX-5’s accessory shoe. It’s a short, stereo condenser microphone, and you can switch between a 90 degree recording angle, perhaps for interviews, and a 120 degree angle for recording larger groups or lectures. It will certainly be better than the NEX-5’s in-built mics. But this type of microphone really only works well if you’re quite close to it, or for recording a sync track (more on this later). For recording lectures and the like you will probably want a lavaliere or even a wireless mic set, which takes us back to the NEX-5’s lack of mic inputs. One option would be to “hack” an ECM-SST1 to turn it into a mic adapter – this has been done. But another, unless you want to upgrade to the mic-input equipped NEX-6 or NEX-7, is to use an external recorder, with the internal mic for the sync track. Then, as you suggest, sync up the audio in Final Cut. Using an external mic, such as the Sony ECM-SST1 will help here. So will a tool such as PluralEyes (which also works with Final Cut Pro 7, which lacks internal audio sync). But to record the best possible sound, and to use the widest range of mics, you need an external recorder. One other advantage of this will be recording uncompressed audio. The AVCHD recording format of the NEX cameras uses compressed, AAC audio. An external recorder uses WAV files, and these are cleaner, and easier to edit. The recorder you mentioned, the Tascam DR-60, will do everything you want. It has two XLR inputs, for using professional mics, and it is designed to screw directly onto a DSLR camera. It also has a secondary, 3.5mm input, should you want to add a radio mic later, as well as an audio output that can route to the audio in on a camcorder or DSLR too. So if you do upgrade to an NEX-7 or a DSLR later, the DR-60 will still work for you. Another device that is worth a look too, is the Zoom H6. In the same price bracket as the Tascam, it is a six-channel device, with modular mic attachments, including a shotgun unit. Zoom sells a DSLR adapter, and the H6 can also feed sound into a camera’s mic input, as well as act as a USB audio interface. But it’s bulkier than the Tascam and is not yet widely available, so the Tascam might be the better bet for now. When it comes to the right camcorder, the choice is rather more complicated. Firstly, though, you are right to discount a DSLR for this type of work. With the right accessories, your NEX-5 will do much of what a DSLR can do, at least where video is concerned. And upgrading to a DSLR will not overcome two limitations: a limited recording time (usually 30 minutes, in Europe), relatively short battery life, and potential overheating problems. For recording lectures and webcasts, a camcorder might be slightly bulkier, but it is more suitable to this task. Cost is not necessarily a barrier, though: good quality, semi-professional or pro camcorders cost about the same as a good DSLR, especially when you add in the cost of DLSR lenses. 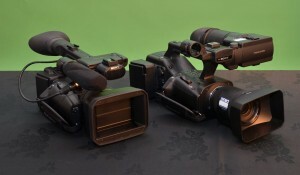 The Sony NEX-VG900 is the company’s top of the range consumer or semi-pro camcorder, and costs around £3,000. It is almost unique in using a 35mm full-frame sensor, similar to that on top-end DSLRs. The NEX-VG900 has an accessory adapter for XLR mics – although this is not cheap – as well as a 3.5mm mic input, headphone socket, LCD screen and electronic viewfinder. It records in the AVCHD format, onto low-cost SD cards, but it is also possible to hook up an external recorder, such as an Atomos Ninja, via the HDMI slot. This could be useful for recording long events. The VG900 does not, though, work as a full-frame camera with Sony e-series lenses. For this, you need to use the (included) Alpha lens adapter. This might not be a barrier for you, if you have Alpha glass already. But for video, you might want a video zoom lens, and this will result in the VG900 working in cropped sensor, APS-C mode. Another factor to consider is that hitting sharp focus on a large-sensor camera is harder, due to the shallow depth of field. The VG900 will produce beautiful video, but it might not be the best tool for recording lectures. Staying with Sony for the moment – and this will help if you want combine video with footage from the NEX-5, there are two other options. The first is a more compact and more economical alternative to the NEX-VG900: the NEX-VG30. This is still an interchangeable lens, e-mount camcorder, but with a smaller, APS-C sensor. This makes it smaller than the VG-900, and means that there is no crop factor with e-mount lenses. This is the third generation of Sony’s APS-C consumer camcorder and they are somewhat under-rated: the NEX-VG30 is a capable camera, but also now supports power zoom lenses. For recording lectures, this type of lens is well worth considering. In the UK, Sony sells the NEX-VG30 with power zoom lens for £2499 including VAT (less if you shop around); this is about £500 cheaper than the VG-900. Another option – and perhaps surprisingly, for not much more money, is the professional, NEX-EA50EH. This is the first interchangeable lens camcorder in Sony’s lower-end, professional, NXCAM range. NXCAM cameras use AVCHD recording and low-cost SD card storage, but add some pro features, such as uncompressed audio recording and XLR inputs. The NEX-EA50EH is a semi-shoulder mount design, so it is larger than the other options. But the viewfinder and lens can be removed so it will pack down into a small backpack. The camcorder produces impressive quality images, and comes with the power zoom lens, but there is still the option of using an e-mount or Alpha lens for more creative shots. Perhaps surprisingly, the NEX-EA50EH sells for around £2700, less than Sony’s suggested price for the VG-900. Should this be outside the budget, though, there are three more camcorder options from other manufacturers. 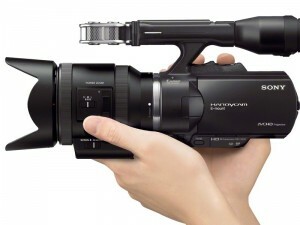 The first is Panasonic’s AG-AC90, which is a conventional-style camcorder with AVCHD recording and XLR mic inputs. It does, though, have a much smaller sensor: 1/4.7 3MOS. This is good for maintaining sharp focus, but less good in low light. The camcorder sells for around £1500. 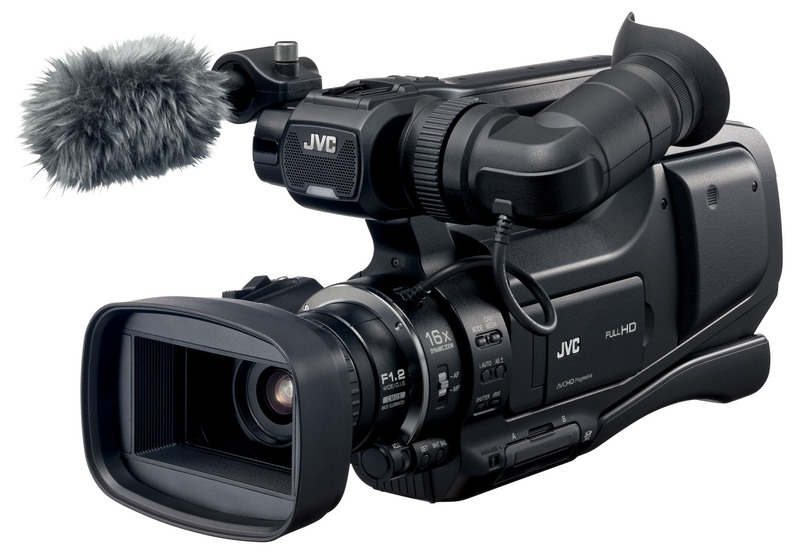 JVC also makes the GY-HM150E, which is an older design with three, ¼ inch CCD chips. It is, though, an economical choice, selling for around £1400, and has the advantage of recording video directly into QuickTime files. This is great for editing in Final Cut Pro, especially if you need to upload videos quickly. It’s also small and light. Finally, though, do have a look at Canon’s range. 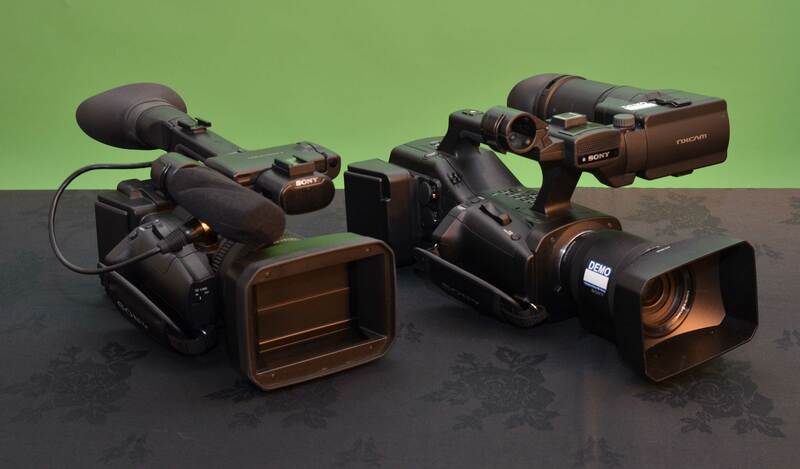 Canon offers two HD compact camcorders, the XA10 and the XA20. The XA10 has a single, 1/3inch sensor and AVCHD recording, as well as two XLR inputs; it also costs around £1400. At 820 grammes it is the smallest camcorder option here. The XA20 is a higher-specification model, with a slightly larger sensor and built-in wifi, as well as the ability to record higher bitrate, MP4 files. The XA20 costs just over £1700. Of course, all of these suggestions involve some trade offs, but don’t dismiss the more conventional camcorder options. For recording lectures and webcasts, they may well prove more reliable, and easier to work with, than the more “artistic” choices. Pricing is based on the latest prices from authorised professional dealers, in the UK, including VAT.